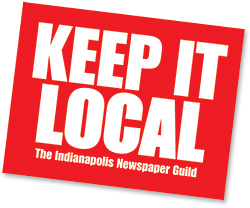 The Indianapolis News Guild informed Editor Dennis Ryerson by e-mail this evening that we are requesting the right to bargain any change to the current time-keeping system, based on conversations that officer and stewards had with staff, email you sent us, as well as peer newspapers we spoke to, none of whom use a fingerprint-like system in place of manual entry. [Some use a card-swipe, but in cities like Nashville, only newsroom employees with set hours (copy desk, design) use a swipe card.] We’ve asked for a meeting, and will keep you posted on the response to our letter [Read the attached email that we sent Ryerson today]. The Star is certainly entitled to implement reasonable modifications to any time-keeping system that controls costs while protecting the sanctity of the contractually regulated 40-hour workweek. We assume the company’s goals are to reduce the hassle of manually collecting and inputting paper records. But the system planned by Gannett for the Indianapolis Star, as initially outlined by HR, seems unwieldy and counterproductive to your main goal of efficiency — and the Indy News Guild is formally requesting the right to bargain this before the system goes “live,” as it represents a change in past practice. I hope you will urge to the highers-up here at the Star that the Guild would only be OK with switching to a card-swipe timekeeping system as a last resort — and that we definitely OBJECT to any type of finger or thumbprint imagery-based system. We are NOT AGAINST computerizing the time-keeping system, but why the company is fast-tracking an initiative before seeking input from the staff seems unclear to us. And any system needs to be applied fairly and logically. Main issues (but by no means are they the only ones) we’ve identified: Employees will waste time trying to make sure they are “on track” and aren’t being shortchanged or aren’t “going over” as they progress through the 80-hour pay period; employees will deluge paraprofessionals or supervisors in their respective departments to adjust times at various points during the week, since this is a new system and they aren’t accustomed to the punch-clock concept — particularly if they take a lunch and forget to clock back in; and, how do you improve efficiency if you still have a manual-entry paperwork system for Guild-covered employees outside of the main office; and other Gannett papers vary, just like Indianapolis, in how they keep records. The overwhelming preference among Guild members is that we maintain an “honor” system (employees turn in paper timesheets at the end of each two-week pay period). HR Vice President James Keough told the newsroom via Q&A that Gannett has this Kronos system in place at Detroit, Cincinnati, Phoenix, Nashville and Rochester, among others … but we checked … and the newsroom in Detroit does not use a fingerprint system (just swipe cards). Rochester has swipe cards but not a fingerprint system. Nashville has Kronos but the reporters and photogs don’t use it — just those on the design/copy desk, and by swipe, not fingerprint. Cincinnati’s newsroom has no system, contrary to what was told to us. Hawaii considered Kronos 3 years ago but it was abandoned when the Guild informed the Advertiser it would ask its members to track every second. The Arizona Republic reporter AND copy desk veteran I talked to on the phone — veterans of that operation — say they e-mail their time sheets to a coordinator each week, and said they are not sure where James’ information about Kronos use originated. Why not a compromise: a Web site that would allows employees to type their hours into a database so those employees in the Downtown office (or working in the zones or remotely) could sign in and keep track of their hours. That would save paraprofessionals a lot of headaches; online producer Joey Marburger was working on such a system before he departed for Gannett HQ near D.C.
Reiterating: the Guild is NOT OPPOSED to computerized time-keeping but does object to the planned fingerprint time-keeping system and has questions that need to be addressed. We look forward to more discussion on this issue, Dennis.